It has been hard financially since moving to the Denver area, and my savings is getting ready to run dry. So to keep me afloat to continue photographing and taking care of my mom, I am preparing to make a limited run of of my favorite American Bald Eagle image for Christmas. These will be printed in a 8×10″ size on a Metallic Paper, giving them a three dimensional look, and matted with a 10×13 mat ready for framing. The mat will be signed and numbered by me. The image bellow is an example of what your final order will look like. This will be ready for framing in a 10×13 frame. For $60 $50 today only you can get this one of a kind photo gift for your loved ones, friends, for your office and more. 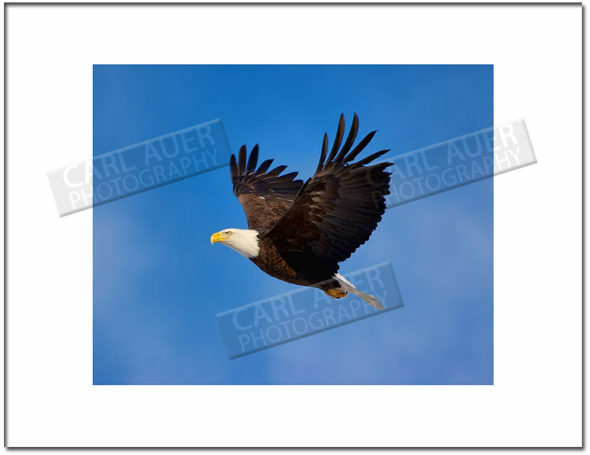 If you would like the image framed, please add $75 to cover the frame and shipping. Individual prints are shipped for free. I will have the prints ready to send out the first week of December for those who have ordered by the end of November. These prints will be numbered, and the number will be out of how many are ordered. To order your print, you can PayPal the $60 $50 for print, or $135 $125 for the framed print to carlauer@gmail.com. Be sure to state if you want a print or a framed print, and how many if ordering more than one. If you do not PayPal, please email me at the above address for other payment options. This photo was taken by me in Eagle River, Alaska, just outside Anchorage a couple days before the start of the Iditarod sled dog race. It is by far one of my favorite Bald Eagle Photo’d I have taken over the years. This would be a great Christmas present! Also, please remember to check MaxPreps for photos of Colorado High School Sports which make great presents for Grandparents and Eagle River Parents, my archive is still up and being added to weekly with older events. This entry was posted on Tuesday, November 13th, 2012 at 6:38 pm	and is filed under Outdoors. You can follow any responses to this entry through the RSS 2.0 feed.